Indica dominant strain with elevated THC levels and a sweet flavor. Sometimes two strains are joined and produce something extra special, combining Girl Scout Cookies and Blueberry together has done just that, with the creation of Blue Cookies. These feminized cannabis seeds are now available through us, and produce some of the finest, mouth-watering buds possible. Blue Cookies cannabis seeds are an Indica dominant hybrid strain that contain the very best elements of both its parents. Considered a moderately easy strain to grow, it can be cultivated both indoors, within a purpose built area, and outside during the growing season. Completely feminized, each seed is devoid of any male chromosomes, ensuring a stable, pure female plant every time. The Indica dominant genes produce a compact, bushy plant that responds well to super-cropping techniques, while remaining easy to grow for beginners. Flowering times are average for an Indica dominant hybrid, with Blue Cookies requiring approximately 9 weeks of daily, uninterrupted darkness to produce the highest quality buds. Yields are good, with growers producing approximately 400 grams per square meter of dense, fruity buds. The dominant Indica influences within Blue Cookies cannabis seeds produce dense, colorful buds, generously coated with resin. THC levels are high, averaging approximately 20% and with a CBD content of 0.3, produce a euphoric high and deeply relaxing ‘body-stone’. A perfect cannabis strain for relaxing and unwinding after a stressful day, as an aid to reducing pain, and to assist in a good night’s sleep. The complex flavor and aroma from Blue Cookies contains elements of fruity Blueberry and sweet candy, making it as delightful on the palette, as it is on the head. A perfect choice for growers of all levels of experience and growing techniques. 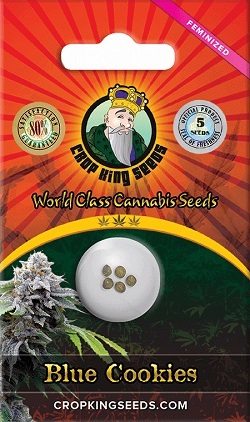 You can buy Blue Cookies cannabis seeds in packs of 5, 10 and 25 feminized seeds, all dispatched directly by Crop King, one of Canada’s leading cannabis seed producers and suppliers. Enjoy first-class customers care and the highest quality cannabis seeds when you buy your cannabis seeds online. Click below to learn more and buy Blue Cookies feminized cannabis seeds. Buy Blue Cookies Feminized Seeds today and receive fast discreet shipping to Canada and all US states.